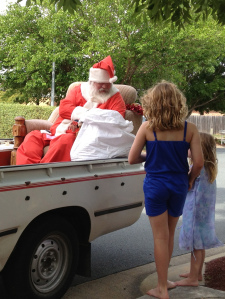 Home › Other › Did Santa just drive down my street on the back of a ute? A good friend of mine, Brendo, donates his time each December to spread Christmas cheer and glad tidings across the region. 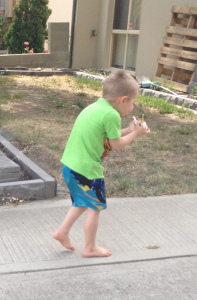 He bolts an armchair and two dining room chairs to the tray of a ute, dons his Santa suit, and is driven around the suburbs of Canberra by ‘Rudolph’ giving away lollies in the middle of the hot Australian summer. My friend has been doing this since 1983 when it started as a bit of a joke with a few mates in their local area – in a hired costume and a pillow case for a Santa sack. Brendo was the obvious choice to play Santa because he didn’t need any padding. In the past, he would dye his beard but now he can go ‘au naturel’. ‹ We supersize other things, so why not snow domes?